Pictured above is our Donuts with dad last year. 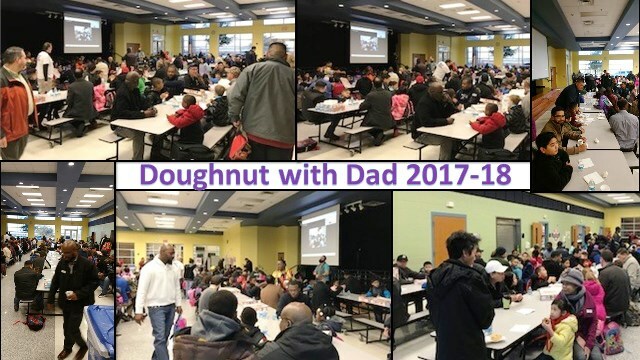 Our cafeteria was full of smiling fathers and happy kids. It will not take long to scarf down the 400 plus donuts we have ordered. The event is simple. Check in at the front, go to the cafeteria with your child or children who are at Cabaniss, then sit down and enjoy a couple of donuts, coffee or water. If your children like something special to drink please bring it with you. We will have a very brief howdy from our Dad' Club leaders and WATCHDOG team, Mr. Lederman, Mr. Looney, and Mr. Dye, then we will let you go. Where you venture off to is up to you. Before you hurry to work, we would suggest you sign up for a WATCHDOG day at our school. The calendars will be on the cafeteria walls. We will explain that to you at the meeting. You can also go to the Library with your children and visit the Book Fair. We will respect your time so the dad's club meeting will be over in a flash...just like the donuts.